Posted on November 22, 2014 | by cookwithwhatyouhave | 8 Comments on What to do with 1/3 Can of Coconut Milk? 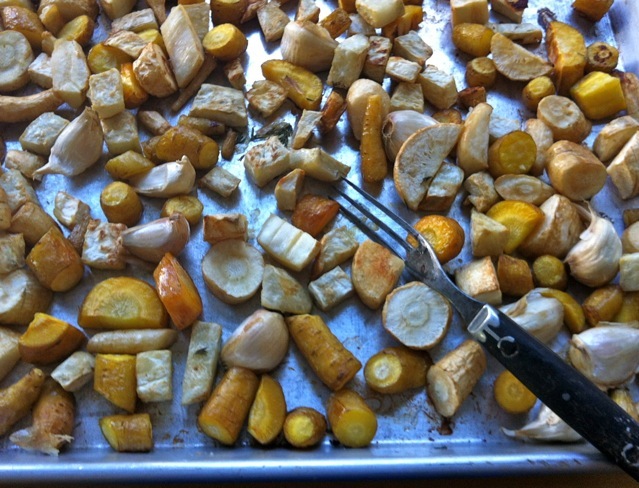 Roasted parsnips, carrots, celery root (celeriac) and garlic cloves–delicious as is or turned into soup. The always inspiring Heidi Swanson of 101cookbooks.com wrote a post last week about writing a blog for a dozen years and the importance of having a voice and a point of view. She muses about how she could do more video work or more this or that that others suggest she might do but that what she really wants to do is write recipes and take beautiful photos. For years I posted a recipe once a week and then as my business shifted and I got busier I posted less and less often in part because, unlike most other blogs I love and follow who post recipes, I rarely had the perfect, tested-multiple-times, beautifully-photographed-step-by-step recipe to post, so I didn’t post at all. Well my business (and life’s mission) is not called Cook With What You Have for nothing. And cooking-with-what-you-have everyday to make simple, nourishing food for those you love is often messy and rarely terribly prescriptive. So, I’ve decided to post much more often again and if it’s four different salads in a row that all turned out deliciously but just used what I happened to need to use up then so be it. I won’t be posting them to suggest that you exactly emulate what I did or that it was the best thing I’ve made in months, but maybe it will inspire us all to look around our kitchens and gardens and use our imagination and have a meal of this and that and feel satisfied. Case in point. . . I needed to clean out my refrigerator before the next CSA share arrived and found a bunch of small parsnips and carrots and half a celery root. I scrubbed and trimmed everything and tossed them on a baking sheet with some oil and salt and a head’s worth of garlic cloves and roasted all until browning and fragrant. I ate some of this goodness for lunch, standing at the counter before heading out the door for a meeting. The rest was reheated in plenty of vegetable broth (inspired by a post of Heidi Swanson’s many years ago!) with a bit fresh sage and thyme and then pureed and eaten for dinner with a bit of olive oil and plenty of black pepper. It was too dark by that time to take a photo of the soup and it was tastier than it was pretty so use your imagination. My cover crop of crimson clover has just sprouted, I’ve planted my garlic and have two fairly robust pots of lettuce and arugula growing steadily. The rest of the garden is slug ravaged and pretty drab. Our small garden that can produce quite a bit in the warmer months is not sustaining us now, by any means. I stay cozy inside and don’t venture into the garden much other than to dump the compost and make a quick dash to pick herbs–which actually are still very robust and much appreciated. Meanwhile some farmers I know are just wrapping up their summer shares and starting their winter ones. More and more of them, in order to sustain themselves (and us!) 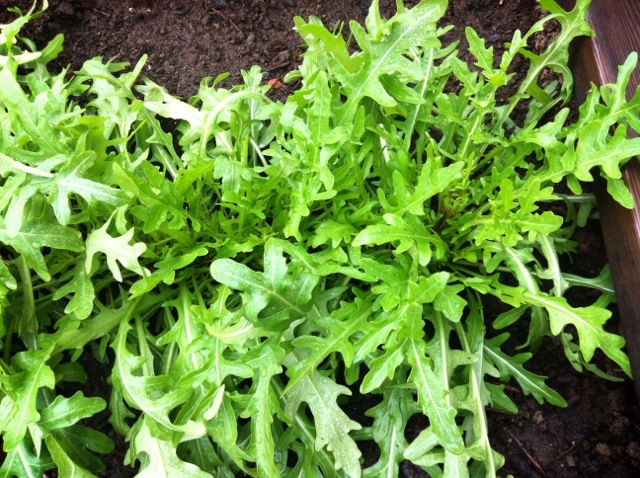 are growing and/or storing produce all year round. I recently had the privilege of writing the forward for the forthcoming book Planting the Future: Profiles of Oregon’s New Farm Movement which profiles a fascinating mix of farmers, ranchers, seed breeders and advocates. It is abundantly clear from these profiles of these resilient, hardworking people who care about bio-diversity, people, land and their communities that WE, the eaters/consumers, have a critical role in their survival. So I want to give a big, loud, thankful shout-out to the farmers who I have the privilege of working with directly who would very much like to keep you healthy and happy this winter with their beautiful produce. 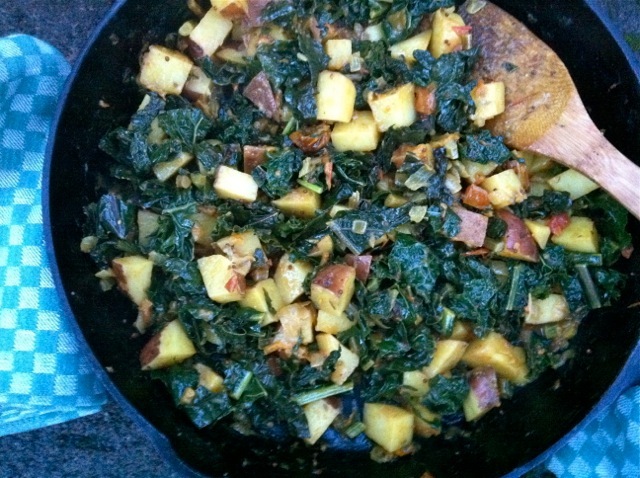 CSAs embody the epitome of cooking-with-what-have. The farmer chooses what’s best and that’s what you get. In the words of my ever-philosophical seven-year old, “you get what you get and you make the best of it!” and that’s not difficult with this produce because you are getting the best of it already. And if you don’t live in the northern Willamette Valley in Oregon you probably have CSAs or winter farmers’ markets in your area where you’ll find similarly wonderful produce. If you do per chance sign up for any of these CSAs you will automatically get access to my subscription-only Seasonal Recipe Collection. And if you sign up for Sun Gold Farm’s one-time Thanksgiving share you’ll get a custom set of recipes. Happy cooking to all and thank you dear farmers for going out in the rain and muck and wind and sleet when I’m cozy inside writing recipes! 47th Ave Farm’s Winter Share starts the first week of November. The share features field grown crops like Tuscan kale, leeks, Purple Sprouting broccoli and sweet winter carrots. It also includes storage crops like Delicata & Sweet Meat winter squash, Amish Butter popcorn, a variety of potatoes, onions, dry beans and more. Sauvie Island Organics is offering a Winter Storage Share for the first time that will include yellow French carrots, German Butterball potatoes, Dutch red shallots, nutty Japanese Kabocha winter squash, juicy Kohlrabi, crispy Daikon radishes, and more. Minto Island Growers continues to provide a Winter Share for both Salem and Portland area customers with a wide variety of storage crops like carrots, potatoes, celeriac and just harvested greens and brassicas. For additional Winter CSA options visit Portland Area CSA Coalition. There are also several wonderful year-round farmers’ markets including Hillsdale Farmers Market, Portland Farmers Market, and People’s Co-op Farmers’ Market. 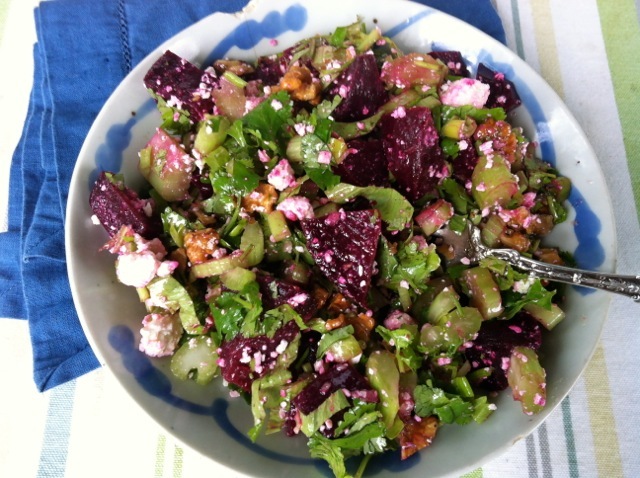 I toss together a lot of beet salads, some of which make it into the recipe collection. This one, as they always do, resulted from what I happened to have on hand. Adapt as you see fit but the crunch of the celery, the sweet, robust beets and the sharp zing from the garlic is a particularly fun combination especially in the cooler months. Whisk the mashed garlic with the olive oil and vinegar. Toss this dressing with everything else, except the beets. Gently toss in the beets. Taste and adjust seasoning.